In his 2016 documentary HyperNormalisation, Adam Curtis argues that the world of the 21st century is not what it seems. Reality is actually an elaborate, if somewhat unintentional, illusion. For the last half-century, governments, corporations, and other power brokers have used various forms of propaganda, technology, and sleight of hand to deceive us. What we believe to be an ordered, structured global paradigm is actually suffuse with chaos—a chaos that is not only unforeseen, but impossible to contain. Alex Garland’s newest film Annihilation is in dialogue with this idea, the idea that, despite the advances of science and technology in the 21st century, truth itself is as elusive as ever. The greater a claim we make on what is real, the more it seems to slip through our fingers. Annihilation portrays the chaos of “post-truth” in narrative form. There are two ways to read a film like this: One is to try and decode and explain away all the confusing imagery and plot points. Another is to embrace the mystery in search of a deeper, metaphorical truth. And since Annihilation is constantly inviting us to question what we think we know, percolating the dialogue with admissions of ignorance and bafflement, I am more inclined to follow the second path. Let’s admit there are things about this film—and, really, everything else—that we simply cannot know. Annihilation opens with an interrogation of “what happened” on Lena’s (Natalie Portman) expedition into the Shimmer—a vast stretch of land that has been engulfed in a bizarre, shimmery bubble. Radio signals do not penetrate, and those who have ventured into it have not returned. Despite his curiosity, the interrogator (Benedict Wong) is stonewalled by the constant refrain, “I don’t know.” Lena’s husband, Kane (Oscar Isaac), mirrors her confusion when he returns after a year in absentia. Either their memories are compromised, or they have fallen into to some kind of post-traumatic stupor. This is not a cheap trick designed to delay narrative details, nor is it a way to preempt scrutiny of the story’s inner logic. By its nature, science-fiction invites viewers to probe specifics in a way that other genres do not, so while it is tempting to scrutinize every narrative detail, it only distracts from the larger point. 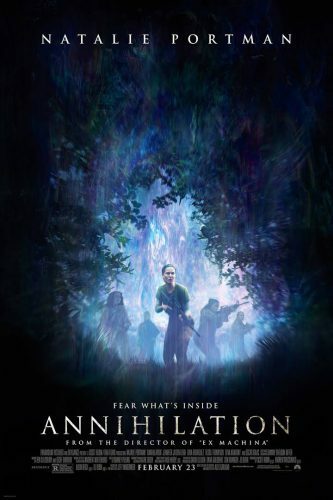 Annihilation holds that chaos is fundamentally inscrutable, and what we perceive to be the “natural order” is actually an illusion of chaotic behavior. Reality, as we perceive it, stems not from truth, but from the interpretation of patterns by pattern-seeking minds. When that facade comes crashing down—as it has for Lena, Kane, and everyone else perplexed by the Shimmer’s existence—all that remains is mystery and ignorance, a jumbled set of raw data. Like all human beings, the characters in Annihilation are plagued by desires—to survive, to heal, to recover from grief. But more than anything they want to understand. Dr. Ventress (Jennifer Jason Leigh), the most coldhearted of the bunch, takes this a step further and relinquishes her claim to life in favor of mere understanding. She wants to know what is at the heart of the Shimmer. Lena is driven by a similar instinct, interpreting understanding as a means to an end, the end being her husband’s survival and the recovery of her marriage. Anya (Gina Rodriguez), driven by a ferocious need to know Lena’s intentions, ties up and interrogates her crewmates. Josie (Tessa Thompson), feeling fulfilled by an understanding of the Shimmer’s nature, gracefully embraces a peaceful form of annihilation, as her body is literally consumed by flowers. But these desires are the byproduct of higher cognition. At the cellular level, there is only one drive, one want, and one instinct: to divide. That is the fundamental behavior of all life on Earth—and yet, not so the creature at the heart of Annihilation. For the lighthouse creature, cellular division is an oddity, a quirk, a peculiar method of procreation. The expression of “refracted” cells in the Shimmer are imitations of what the creature perceives Earth-based life to be, imitations born of its own procreative method. There is no rhyme or reason to this behavior, because it is not shackled by wants and needs. Both Dr. Ventress and Lena, on separate occasions, question if the being even desires at all. Like life at its most fundamental level, the lighthouse creature does not desire anything. It merely subsists, and its subsistence is based on the perpetual formulation of organic alternatives. The natural order of cellular division appears to stem from the chaos of molecules—but it’s the molecules that are fundamental. What the lighthouse creature contributes to the Shimmer is a distortion of life’s procreative mechanism: one that not only divides, but dilutes. Our higher-level desires are not indicative of anything more than macroscopic psychic expressions. They are refractions, or fragmentations, of their molecular constituents. These cellular drives manifest as great mysteries to our rational minds. But rationality itself is without biological construct. It is an imagined reality. What we are seeing is an outbreak of truth in its elemental form—a reaction to our preconceived ideas of nature, or, in a less allegorical sense, to decades of sleepy political complacency. Here is where the film, and the book it’s based on, does its own kind of elemental imitation. Both the film and the book are inspired by the novel Roadside Picnic by Arkady and Boris Strugatsky. Written in Soviet Russia in 1971, the book imagines the aftermath of an alien visitation to Earth. A series of mysterious “zones” materialize without a trace of the visitors who are presumed to have created them. Here, nature appears to be governed by a different sent of laws. Shadows warp and twist. Rainbows shimmer. Gravity concentrates. Bizarre, physical anomalies pulverize trespassers. And replicas of dead humans reanimate to harmlessly stalk the living. In many ways the novel is a metaphor for life in the Soviet Union, where propaganda and years of totalitarian repression had the effect of overwhelming people’s senses, to the point where they could no longer be sure what was going on, what was true and what was false. Understanding became a futile endeavor. The novel Solaris touches on a similar theme. Explorers of a newly discovered planet are perplexed by the apparent sentience of its oceans. The being, inscrutable to the point of causing madness, seems to probe the minds of the explorers. Doubles, or replicas, of deceased loved ones materialize before the explorers and roam about. But they are not quite the same. Something is not quite right, and we come to wonder if they are ghosts, hallucinations, or manifestations of imprecise memories. And yet we sympathize with the desire to live as if the illusions were real, because it’s more comfortable that way, and less confusing. The sentient ocean, meanwhile, is busy creating giant, infinitely complex water structures in an attempt to mimic or, perhaps, converse with the explorers. But every attempt to communicate is a failure, and the mission ends having learned nothing, having gotten no closer to an understanding of the being. Life, by virtue of its chaotic nature, is unknowable. In her 1971 short story “Vaster than Empires and More Slow,” the late Ursula K. Le Guin reveals to us another type of planetary consciousness, one that reacts to the emotions of its intruders. At first, the forest-covered world appears devoid of life, without animals or anything resembling higher cognition. But eventually the team learns that the forest itself is conscious, reflecting the fears of the crew back onto itself, often in threatening, physical ways. The story questions what we can claim to know in the face of such unfamiliar forms, pitting our own aggressive instincts against that which confuses us. Describing the work, Le Guin herself wrote, “We all have forests in our minds. Forests unexplored, unending. Each of us gets lost in the forests, every night, alone.” The forest is an enigma, an unexplored, unknowable glimpse into the abyss. Here’s something we do know: Life self-destructs. Whether it’s the Shimmer, the zones of Roadside Picnic, the planet of Solaris, or our own imagined reality of life in the 21st century, life subsists on itself—devoid of want, growing, dividing, and, eventually, self-destructing. As Dr. Ventress asks Lena, a biologist, “Aren’t all cells coded for self-destruction?” The answer, which is never explicitly given in the film, is yes. Programmed cell death ensures that. But there’s one exception: cancer. Cancer defies the immune response to self-destruct, and instead continues to grow and divide until the host is annihilated. Cancer does not “desire” anything. It perpetuates without reason or explanation. But again, I want to avoid reducing the Shimmer or the lighthouse creature to a metaphor for cancer. As Lena says toward the end, the creature didn’t attack anything. It was Lena who attacked it. Instead, the creature was merely formulating a new kind of life, one based on the perpetuation of organic alternatives. Lena perceived this new form as a threat, shot it, bombed it, and rather than defend itself or retaliate, the life form reacted with confusion. Life on Earth is just as perplexing to the creature as the creature is to life on earth. And so it burns everything down. The Shimmer is a new conceptualization of life. It subsists not on cell division, but on refraction: Constituent parts of an organism’s identity or DNA are gradually diluted in service of an amalgamation of species. We see beauty in this: the flowering of different species on the same branch, the refraction of light into rainbows, or the crystallization of sea water into gigantic fractal structures. But the beauty is deceptive. Beneath it, there is only the chaos of molecules in a vacuum. Memories are fragmented as cells and organisms divide, taking any notion of identity with them. The process repeats, still dividing and mimicking until the original nature has been consumed by cross-speciation. There is no individual, no singular identity or organism in the Shimmer—only a tapestry of life. In fractal geometry there’s a sequence called a Julia Set. Graphically it’s represented as an infinite fractal pattern. You apply two complex numbers and render any infinite result as a certain color. What emerges is a pattern without top or bottom, without beginning or end, only a boundless and chaotic expression of self-similar shapes. While the initial sequence is simple and without form, the iteration of the pattern gives way to something truly elegant. As you step away from the “rules” that define the set, you’ll see a psychedelic fractalization—infinitely deep and structured, infinitely beautiful. But the structure is an illusion—a pattern imposed by our pattern-seeking minds. I don’t think it’s a coincidence that Annihilation ends, literally, with an animation of a Julia set. It spirals and fractalizes before a large, seemingly infinite flowering of life, growing and subsisting until the original forms, too, dilute and wither into nothing. Posted in Film Reviews and tagged Annihilation, Film, Science Fiction. Bookmark the permalink. Trackbacks are closed, but you can post a comment.